For a host of climactic reasons, (which I won't pretend to understand), we've had a bumper crop of autumn fruit this year. Just the other day, a friend of mine was complaining about her "glut of apples and pears." Has GLUT become the collective noun for apples and pears in your house, too? Unlike my friend, who has a small orchard, we only have one small and wizened apple tree. But it still produced enough fruit to fill my freezer with cut-up apples, crowd my refrigerator with jars of applesauce -- and feed the litter of pigs at our next-door farm. Sadly, we aren't as blessed with pears. We do have one tree, but its fruit is inedible (and, rather conveniently, drops straight into our compost bins). These gnarly little pears would probably make a decent chutney, if I were enterprising in that way, but my tastes lean more toward Pear Tarte Tatin. If you are fortunate enough to have a glut of pears, you must try this classic French pudding. It is absolutely scrumptious. This simple recipe has been adapted from Hugh Fearnley-Whittingstall. 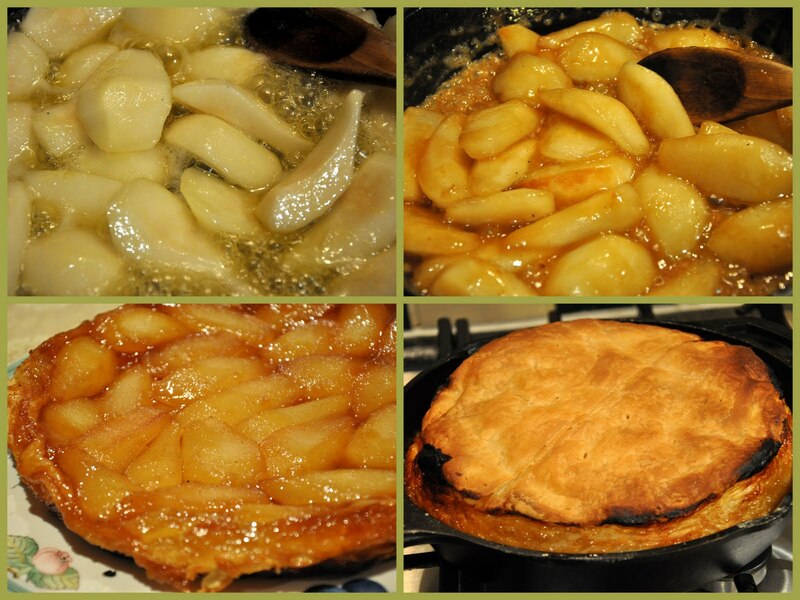 You can use a ceramic tart/pie plate OR a cast iron skillet to make the tatin. I used my cast iron skillet, which makes it a one-dish affair. First, roll out the pastry quite thin. It should be a large round, about a centimetre or two larger than the tin/skillet that you are using. The puff pastry is 500 grams, but I discovered that about 400 grams is enough -- and gives a less doughy (and calorific) pastry crust. Prick a few times with a fok and then refrigerate between greaseproof paper. Next, peel, halve and core your pears. Then cut them into thick wedges. Unless your pears are really big, you will get four pieces from each pear. The pears shrink quite a bit, so err on the side of more pear than less. Cook for approximately 20 minutes -- or until the fruit is golden and you have a thick caramel-coloured sauce which coats the fruit. Then arrange your fruit, cut-side up, because of course you will be flipping the pan after it bakes. Make sure the fruit is crammed together with no space between. Now set aside to cool. Drape the pastry over the pears, and tuck it in around the side of the pan to enclose the fruit. Bake for 20-25 minutes in a hot oven (220 C) until it is golden brown. Leave to cool for five minutes, and then run a knife around the sides and carefully invert the tart on to a plate. Let it set for a few more minutes and then serve warm. A scoop of ice cream isn't necessary, but it certainly doesn't detract. Note: The tarte tatin really should be served warm, but you can get the pear mixture and the pastry ready long beforehand -- and then just assemble and bake at the last minute. Moving on to apples . . .
my problem is too much applesauce. We burned out on the stuff weeks ago; now what to do with the excess? Happily, I remembered a muffin recipe known, in our family, as Johnnie Applesauce Muffins. My grandmother used to make these for my father when he was a little boy -- just a few years ago, you understand -- and I made them for my girls, too, when they were small. But then I forgot about it; actually forgot about it for years. It's one of those oldie-but-goodies that really does deserve a revival. Cream together the butter and the sugar. Add the eggs, one by one, until well-incorporated. Add the applesauce. Mix the dry ingredients together in a bowl. Sift, or toss gently. Add the raisins and walnuts if you are using them. You can, of course, leave them out -- but I wouldn't advise it. The original recipe doesn't call for them, but I think they boost the flavour -- not to mention the nutritional value. Add the dry ingredients to the liquid ingredients -- and mix together gently with a wooden spoon. Don't beat them or overmix them, as this makes for a "tough" muffin. You will have a really thick mixture, which you will need to spoon into prepared muffin tins. (It's easier to use muffin papers, and it helps the muffins stay moist, too.) I like a good-sized muffin, so I fill them right to the top. This recipe will make 12 muffins -- or 18, if you fill them 2/3rds full. Like any muffin, these are best the day they are made. If you don't eat them all on the first day, then freeze them immediately as they will defrost beautifully. I went to a field hockey match this afternoon, and it was absolutely frigid. Mitten weather, really; but I neglected to wear them. Honestly, I deserved and needed a mug of Earl Grey tea and a warmed-up muffin for a late-afternoon snack. These moist muffins, so plump with fruit and fall spices, have so many virtues: They will use up unwanted applesauce, perfume your kitchen and are nutritious enough to serve as a "lazy" breakfast . . . if you, like me, are having trouble getting out of bed early on these dark mornings! Sixteen years of hosting Halloween parties, and I just learned a new trick: Toffee Apples. Now that we live in a country where you can't get those Kraft circles of wrappable caramel, I've been making do without. But despite there being absolutely no need or justification for more sweet stuff, I've really missed this Halloween treat. And how else are you going to get a piece of fruit into a kid on October 31st? As I get older, and wearier, I really appreciate that which is truly EASY. Combine the toffees, the water and the vanilla extract in a medium nonstick saucepan. Stir over low heat until the toffees have melted and you have a thick, satiny mixture. Swirl the apples in the toffee, OR smooth on with a wooden spoon. They will harden at room temperature, but you can also refrigerate them. And even though it may be too late to produce these for this year's Halloween, they would be the perfect dessert for upcoming Bonfire Night on November 5.